While people know the right things to do, many aren’t doing them. Why? On June 14th, Julie Dirksen, creator of Usable Learning, shared her perspective and theories about this commonplace quandary. Using the metaphor, “Your brain is like a rider with an elephant,” from the book, The Happiness Hypothesis, by Jonathan Haidt, Julie explained the reasons behind common behavior change challenges. This post will discuss how behavior change works, with a focus on the importance of motivation, and how it can help your instructional design process. To review Julie’s full presentation, click here. When people know better, why do they still do the wrong thing? Julie pointed out that there are no simple answers, but many complicated ones. Generally, people don’t know any better, so ignorance causes them to make poor choices. Sometimes, they lack a general piece of knowledge that allows them to perform better in the future; learning and development interventions prove helpful in these cases. But, these reasons don’t account for poor decisions in the wake of having received the message. The answer, in this case, Julie argued is best explained with the metaphor, “Your brain is like a rider with an elephant.” We have this logical rational conscious verbal thinking brain (the rider), on the back (the rest of your brain) is the elephant – physical, emotional, automatic, visceral brain. You have a little rider, riding a really big elephant. These two parts make up your decisions, and they are not always in agreement on the best thing to do. We all have willpower that we can exercise, but it’s an exhaustible resource. We can hold out, but not forever. 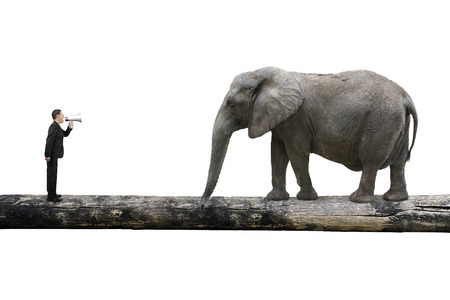 Our “Rider” can drag the “Elephant,” but not forever. This is why, even when we know better, we don’t always do better. The perception of delayed consequence holds great power over us. Julie highlighted two major challenges that prevent people from altering their behavior, and us from creating effective change management. The first happens when people have an unpleasant experience when trying the new system for the first time. We can all relate to this situation: before trying something new, we have an expectation of how it will go, but when we actually try it out and it’s radically different from our expectations, we’re disappointed. When designing learning, consider the causes for learner disengagement, as related to the obstacles that keep them from making good choices. For instance, learners may have had a negative training experience in the past. Maybe the information was irrelevant to their role, or the facilitator didn’t do a good job presenting the materials. They’ll likely resist your learning program, simply because of a program that took place prior to yours. Additionally, any activity that participants have trouble with will likely have an element of delayed consequence. They know they should actively engage in the learning to become better at their jobs, but won’t because they're distracted by more immediate things. Julie emphasized that even when we understand the psychology behind peoples’ bad choices and design training programs to counteract nature, change takes place slowly. Visceral experience seems to be important for belief, and belief impacts behavior. Think about the process of riding a bike: How does it feel when you are first riding a bike and then have been riding a bike for years? You go from this heavy duty conscious feeling of biking to almost unconscious control of biking. You can go faster, so you can allocate your conscious resources to staying upright, avoiding obstacles in the path. Mostly the feeling of a biker is automatic after they have been doing it for a long time. The same is true for any behavior. At first, new habits take concentration and purpose and can be exhausting to execute. Eventually, though, they’ll become second nature. For more information about this change process, Julie recommended, Electronic Performance Support System, by Gloria Gery. We all have willpower that we can exercise, but it’s an exhaustible resource. Research has been done a number of different ways, the term for this is “Ego Depletion”, study done first in 1999, then again by Roy Beaumeister from FL. No Sweat by Michelle Seegar looks at the research all about exercise motivation and it absolutely supports this. If you find exercise unpleasant, it does not matter how much willpower you have, it's going to start to erode. Green behaviors, talking to people about using a lot of paper products and how that translates into deforestation and trees being cut down: Stanford Virtual Reality Labs: Embodied Experiences in Immersive Virtual Environments: Effects on Pro-Environmental Self-Efficacy and Behavior.